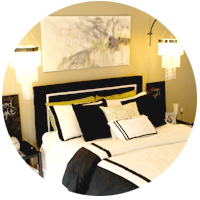 To see MY NEW redecorated master bedroom click here. I had a couple of velvet drapes hung on curtain rods like a canopy over the bed. 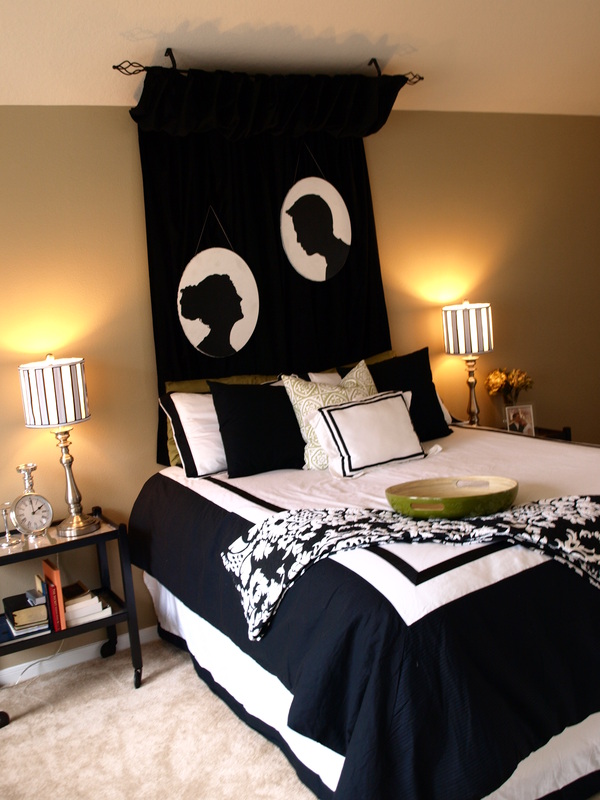 The silhouettes are me and my hubby and are a little too cutesy for our bedroom. These are the lamps that I had which are ok in their own right but not cuttin’ it for me. The chairs looked like they were “floating”. I decided a rug was called for. Also, I didn’t have any blinds and the white curtains were too sheer to block out the morning sun when my hubby wanted to sleep in. Anyway, those pics were taken when we just moved in and had very little $$$ to put towards our room. I improvised with what I had as best as I could and it is an o.k. room but I quickly got sick of the canopy thing and the lack of better window dressings. To spruce it up I actually didn’t spend much more at all but I think it looks much better now. Yay! I kinda LOVE the way my DIY chandeliers turned out and they work great hanging from chain off of some iron plant hangers I bought at Lowes. The upholstered slipcovered headboard I made from the old velvet drapes from the canopy in the above pics. 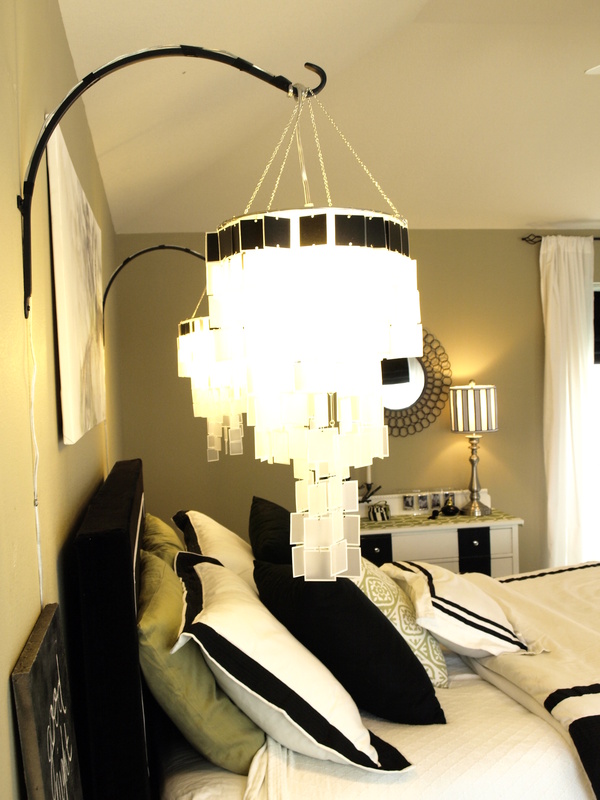 The chandeliers really add a touch of luxury to the space as well as soften up my focal wall. I still need to upholster a seat for my end of the bed bench (which is just two $15 end tables from Target and a throw blanket). I added a fluffy white rug to the seating area as well as black button-up roman shades to the windows for added dimension and privacy. 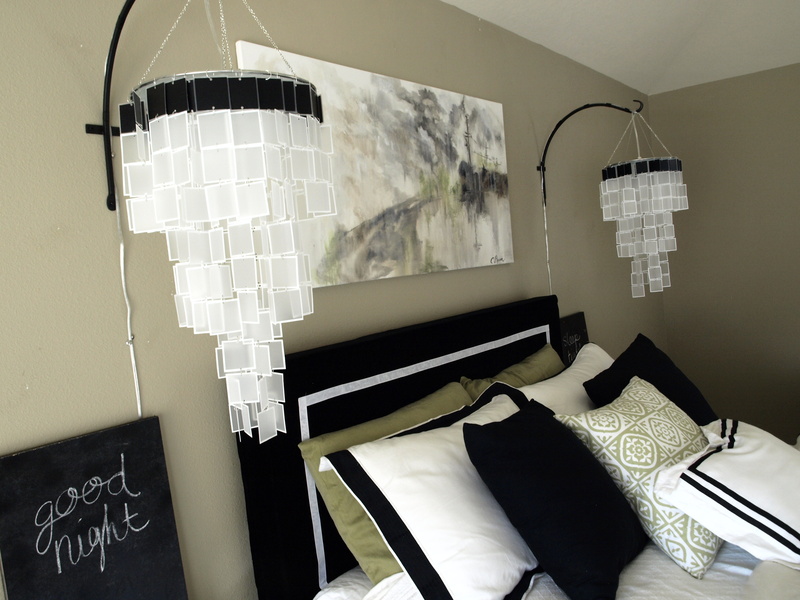 Above is a better look at the DIY chandelier. Its easier to see the detail with the lights off. Please ignore the white dots on the walls. I filled old holes and I still need to touch them up. 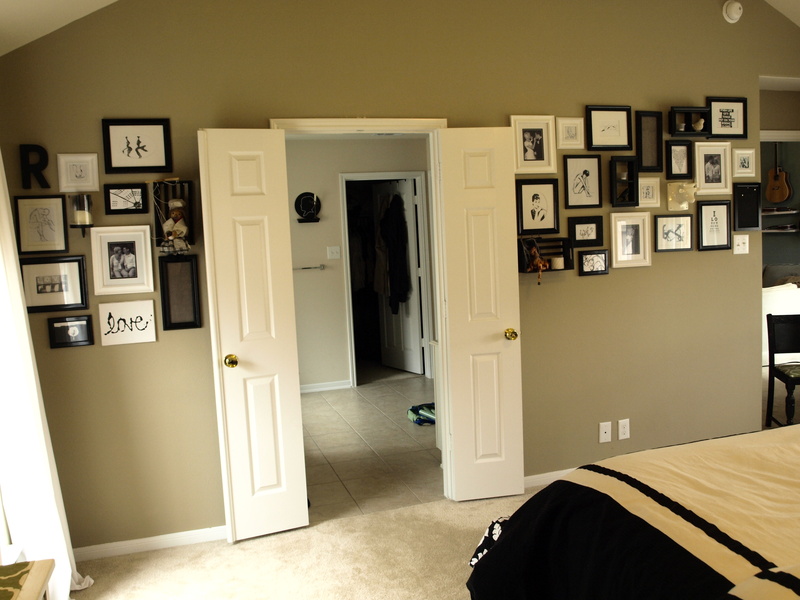 This is a look at the “gallery wall“. There are a bunch of family photos, art, messages, and even some shelves with some of my collected marionettes all collaborating on this wall. My horse puppet from Austria. 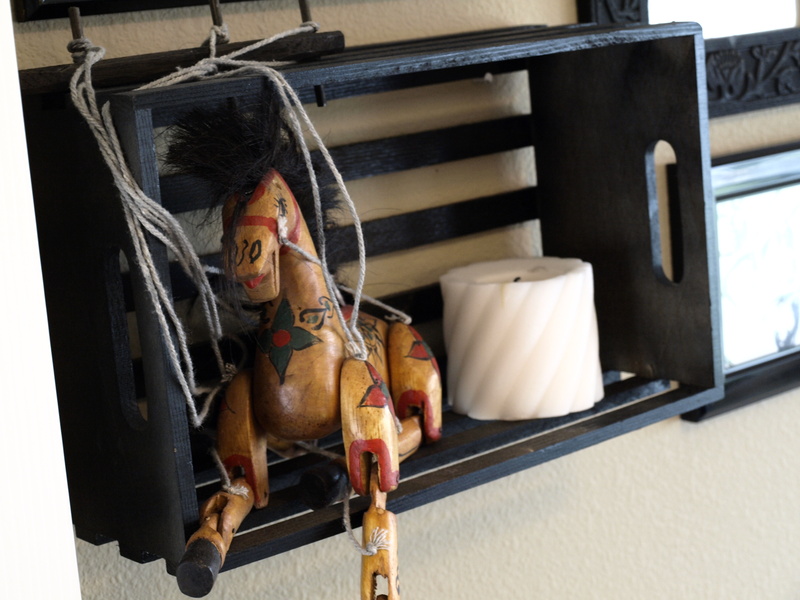 The “shelf” is a crate from the craft store painted black and nailed up. 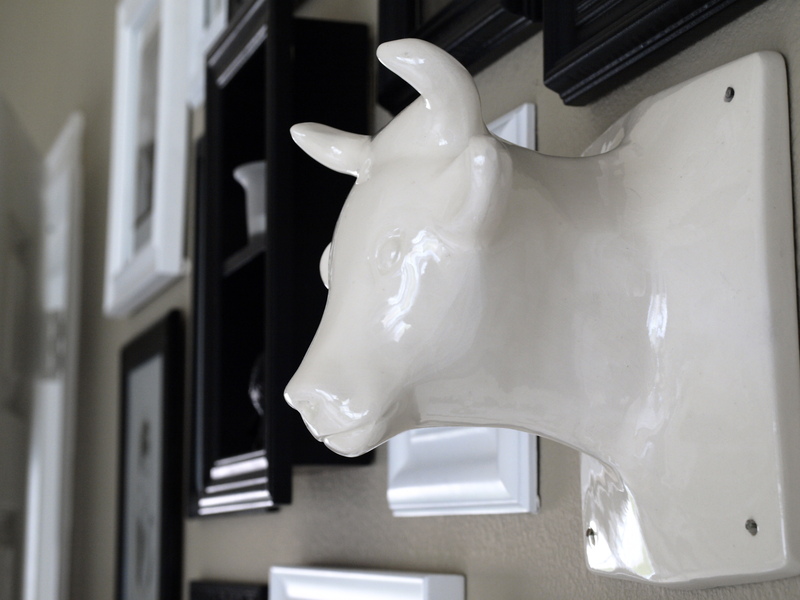 I recently found this porcelain cow bust at a thrift store for $3. I kind of LOVE it. Ok. This is super EASY art. 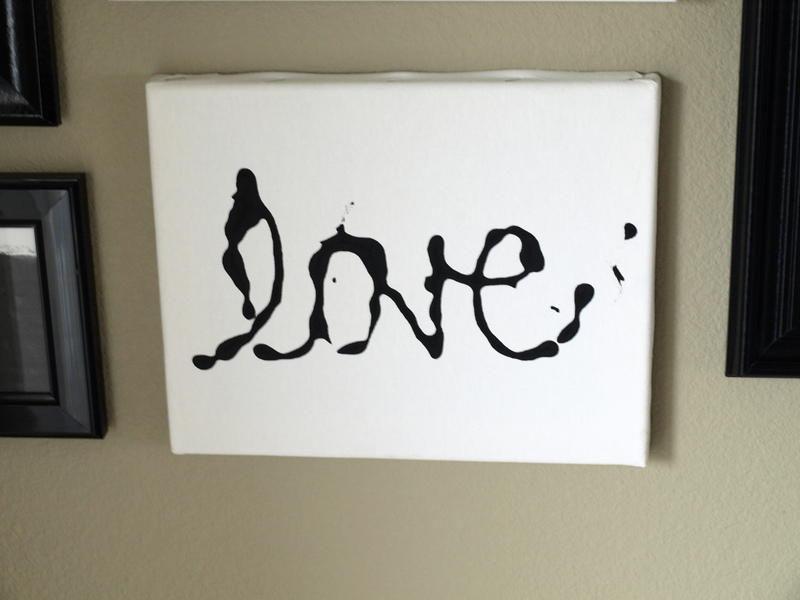 I just took a little canvas I had lying around and carefully dripped craft paint out of the bottle to spell “love”. And I do. Love it. Here is another new find. 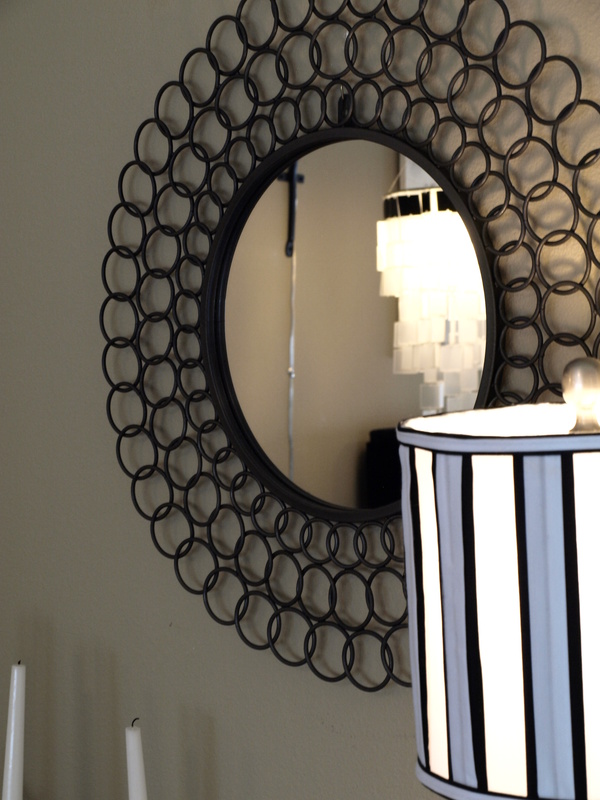 A concentric circle mirror that I bought at Ross for just $19! All I had to do was spray paint it antique silver (it was brown) and voila. Love it along side my old bedside lamp. 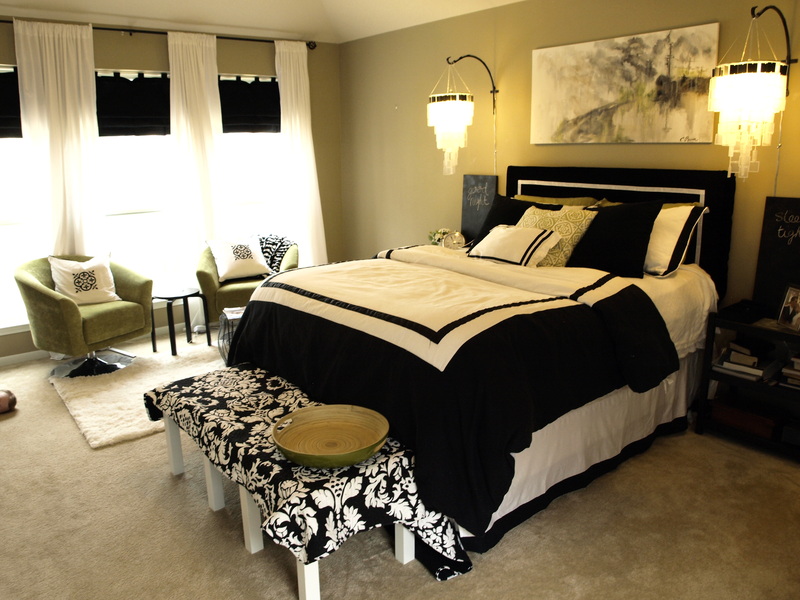 *Tip* Look for BALANCE when lighting your spaces. 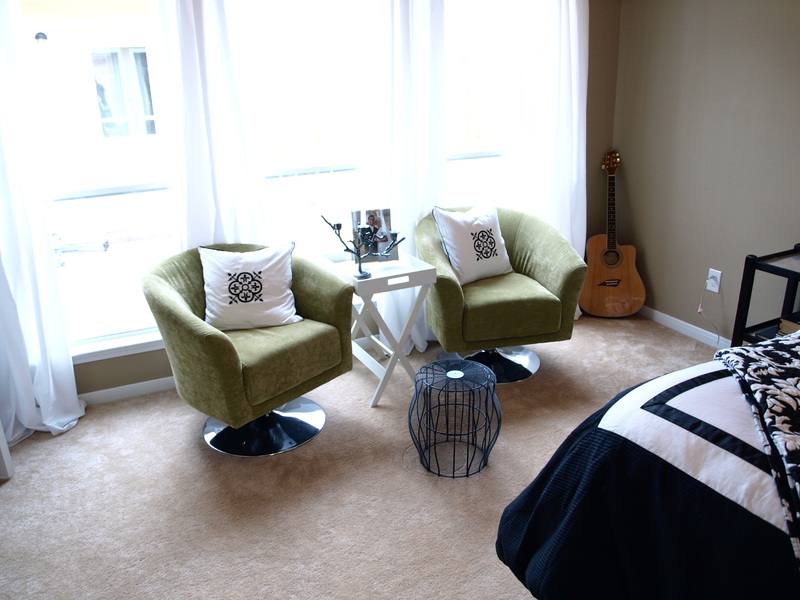 Bounce lighting around the room at varying heights. 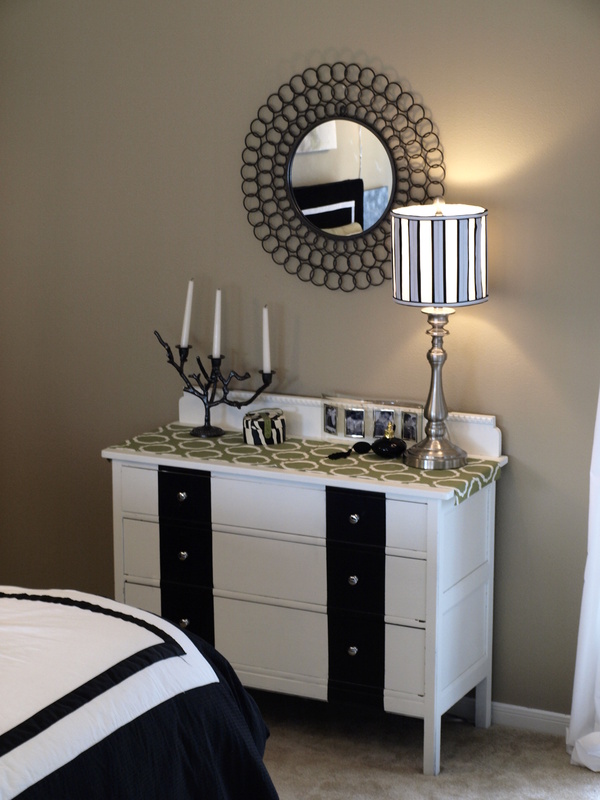 And heres a quick look at what is under it…I’m not done with this dresser…it needs some more OOMPH. Not sure what to do yet though.